Words are vehicles which carry thoughts. They are a way of informing, but also a window into the heart of the one who is speaking. Words also let someone else know how you operate so that they can know you more intimately. 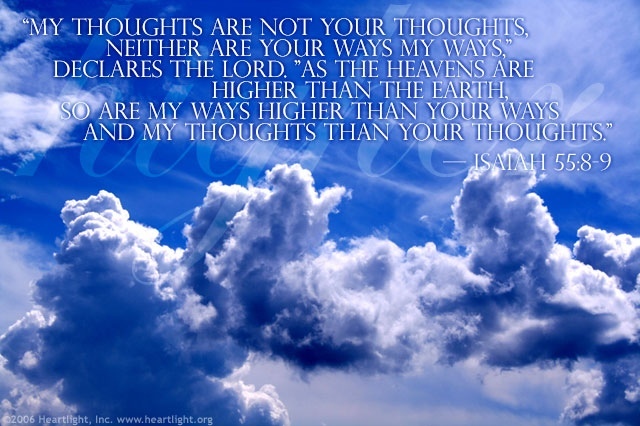 God has chosen to use words given through inspiration to convey to humanity His ways and His thoughts. God spoke about the power of His Words to Isaiah. He starts off talking about His thoughts, and let’s everyone know right away that His thoughts are on a higher level than ours are. And we are not talking about them being just out of reach. They are exponentially higher than our thoughts. So when we critique what God has said, or second-guess His ways, we can rest assured that we are completely unqualified to do so. The created universe we see around us was created by that word. But how do we access that powerful word today? Where would we find it? We can have complete confidence in the wisdom, veracity, and power of the Word of God. There is no need to subject it to the criticism of men, since it’s divine Author is so far above our thoughts and ways. Ours is simply to have faith in what He has revealed and walk in the ways He has prescribed for His children. When we do so, we have the most powerful force in or out of the universe behind us! « Why Are You Wasting Money?